Elongation, measured in a tensile test, is defined as the increase in length as compared with an initial reference length, called the gauge length. However, the elongation result pertains only to the specific shape of the tensile-test sample and the gauge length over which it is measured. 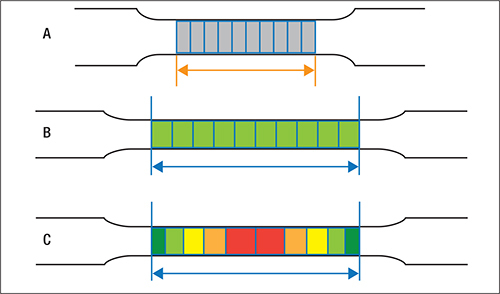 Think of the length-of-line increase that occurs when stamping a blank into your engineered part. An increase of 1 in. is more significant if you start with a 5-in. blank than if starting with a 30-in. blank. Fig. 1—This tensile bar features a gauge length divided into 10 equal sections (A). If all sections expand equally during elongation (B), choice of the initial section for reference gauge length does not matter. But, the greatest strains concentrate near the location that ultimately fractures (as shown in red in (C)). Take the example of a tensile bar with the gauge length divided into 10 equal sections (Fig. 1A). As the tensile bar elongates during a test, each of the sections expands. If all of the sections expand uniformly, then it would not matter what initial section that we chose for our reference gauge length (Fig. 1B). But we know that the greatest strains concentrate near the location that ultimately fractures. In the example shown in Fig. 1C, fracture will occur in the center of the gauge length. Because we have chosen a gauge length to encompass all 10 zones, we average the strains over that entire distance. This incorporates the high-strain areas in the central zone as well as the lower-strain areas at the edges. Using this example, we can visually estimate a 50-percent increase in length when comparing the length after pulling the bar to the initial length. Instead of taking all 10 sections as the gauge length in our tensile bar, what if we considered only the central two sections (shown in red in Fig. 1C)? Here, we estimate a 100-percent increase in length as compared to the initial sections. We are averaging over a smaller region, so our measured strains increase. Each nation or region has a body responsible for writing standard test procedures, with the American Society for Testing and Materials (ASTM) responsible in the United States. Other organizations include DIN (Germany), JIS (Japan) and ISO (international). From each, we can find the appropriate tensile-bar shape for testing of sheetmetal products. ISO takes the approach of designating Type I, II and III bars, which represent ASTM, DIN and JIS shapes, respectively. These tensile-bar shapes exhibit significant differences in width and gauge length (Table—Differences in Tensile Bars and Fig. 2). Although the ASTM and JIS bars feature similar gauge length, the width of the JIS bar measures twice that of the ASTM bar. 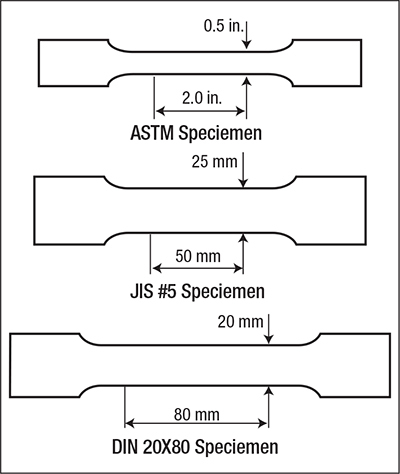 The ASTM and DIN bars feature a 4:1 ratio of gauge length to width, where the JIS bar exhibits a 2:1 ratio. Fig. 2—Tensile bars, depending on the particular testing standard organization, feature differing widths and gauge lengths. These shape differences mean that elongation performance will change depending on the test-sample standard used, even when testing identical material. With the combination of the shortest gauge length and widest sample, elongation from JIS bars typically are higher than what would be generated from the other shapes. Yield strength and tensile strength are not functions of the shape of the tensile bar. The definition of strength: load divided by the cross-sectional area. Even though each of the bars feature a different sample width (and, therefore, a different cross-section), the load is normalized by this value, which negates differences from sample shape. There was a time when all test results received from your service center likely came from ASTM tests. In the 1990s, New Domestic automakers, primarily from Japan and Germany, ramped up production within the United States. For a host of reasons, they sourced significant tonnage with U.S.-based steelmakers rather than importing sheetmetal from their home countries. The requirements for steel grades needed by the New Domestics do not differ significantly than those from the Big Three automakers. What is different: how the sheetmetal should be tested—both the shape of the ASTM/JIS/DIN tensile bar and orientation relative to rolling direction. Sheetmetal production includes the same constraints as many manufacturing environments, with batch production of the same product as the ideal scenario. A heat of steel may total 300 tons of the same composition, and most steel producers target three heats—roughly 1000 tons—as a minimum production sequence for one composition. Consider this scenario: If the end customer needs only 800 tons, that leaves several coils that might be sold to service centers. If the primary customer needs JIS bars, then all coils from that sequence will be tested with JIS bars. Any coils making it to service centers likely include a JIS-based certified-metal-property document. Suppose the certs report 32-percent elongation for a coil, which satisfies the requirement of a minimum 30-percent elongation. A JIS tensile bar will generate a value a few percentage points higher than that generated from an ASTM tensile bar. Combine this with the normal test-to-test variability, and stamping performance may not coincide with your expectations. Some service centers will provide a copy of the certification document directly from the producing mill. This should indicate the tensile-bar type as well as the test direction listed as L or T, referring to longitudinal or transverse relative to the rolling direction. Other service centers will reprint the test results on their own stationery, but may leave off information about the chosen test bar and test direction. Still others will run their own test, but may or may not include bar type and sample orientation. Bismillaah, good morning. i want to ask something, sir. What standard of tensile test that used on figure 1?